The Barclays naming right deal may not be a record, after all; will the revised agreement get noticed by the Times, which puffed it? The most important issue regarding naming rights for the Atlantic Yards arena is why the state simply gave them away--because they were part of arena financing, an Empire State Development Corporation official said not-so-convincingly last July. That deserves coverage. But also deserving of coverage, especially in the New York Times, is the revelation that the Barclays Center deal, once touted as record-setting, may not be a record, after all. Or, if it remains a record, it's by a fraction. The slam-dunk agreement is the "most expensive arena deal" in the country, exceeding the $9.3 million-a-year over 20 years that Royal Philips Electronics is paying to name Atlanta's Philips Arena, one source said. Setting a record price for the naming rights to an American indoor sports arena, the British bank Barclays has agreed to pay nearly $400 million over 20 years to put its name on the Nets' planned future home in Brooklyn. The arrangement could double the old record of $185 million for 20 years that Royal Philips Electronics paid to name Philips Arena in Atlanta in 1999. 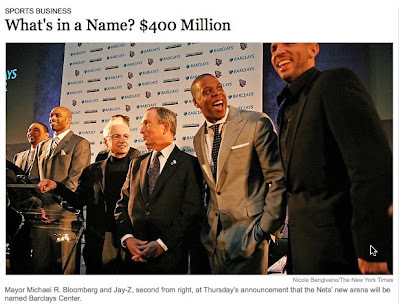 But the Nets aren’t laughable anymore, and yesterday, their principal owner, Bruce C. Ratner; some of his investors, like the rapper Jay-Z; and a few of their players were at the Brooklyn Museum to announce that Barclays will pay a record $400 million over 20 years to put its name on the team’s new arena. Not a record any more? 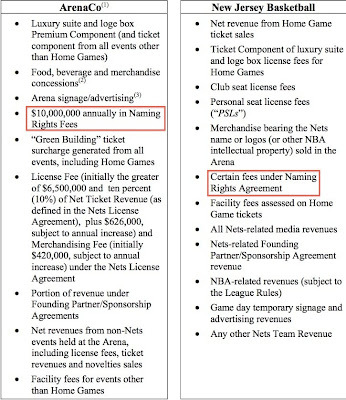 Now, however, we know the revised deal is $10 million a year for the arena plus other unspecified payments to the Nets. The total that is hardly double the deal in Atlanta and, given adjustment for inflation, may not even be any larger. A direct comparison isn't simple, especially given the unspecified payments, but here are two attempts. Should each total be considered a lump sum, $185 million in 1999 equals $239.1 million in 2008 purchasing power, according to MeasuringWorth.com. Alternatively, the net present value of $200 million over 20 years, with a 6.5% discount rate (the same that Forest City Ratner gets from the Metropolitan Transportation Authority on the Vanderbilt Yard deal), is $110.2 million. The net present value of $185 million over 20 years is $101.9 million. But having the latter in hand for a decade certainly might be a better deal. Barclays Bank will shave $200 million off its $400 million naming-rights fee for a planned NBA arena in Brooklyn -- and may wind up with two pro teams for half the price of one, financing documents revealed yesterday. The documents, for Nets owner Bruce Ratner's $900 million project, leave the door open for the NHL's Islanders to join the Nets at the Barclays Center. I don't think a cut in half is a "shave," but at least the Post covered it, as did the New York Observer--which reported the story shortly after I did on Thursday--and the Bergen Record/Star Ledger. The New York Times and the New York Daily News, however, haven't reported on the revised deal, though they--especially the Times--has treated the previous deal as fact multiple times. Given the parent New York Times Company's business relationship with Forest City Ratner, some more skeptical coverage is in order. Barclays Bank has already signed a $20 million-a-year naming-rights deal for the arena, which will be called Barclays Center. [Bruce Ratner] must get the financing done and start work by Dec. 31 in order to qualify for a much needed tax-exempt bond status and hold on to a $400 million naming-rights deal with Barclays Bank for the arena. His 20-year, $400 million deal for the arena’s naming rights with Barclays Bank also expires at the end of the year. The same deadline appears to loom for the 20-year, $400 million naming-rights deal between the Nets and Barclays. AIG doled out payments to a small group of banks, including UBSFor those who have forgotten, Barclays is the bank that agreed back in 2007 to pay $400 million in a 20-year naming rights deal for Forest City Ratner's proposed new basketball arena in Brooklyn. The club... hopes to receive a projected $400 million from Barclays Bank for the naming rights.